– for thematic elements, language and some suggestive references. Film Review With Oscar season over and the winners already having been crowned, many of 2016’s most celebrated films are coming home on disc and via digital release all around the same time. The latest to come home is Denzel Washington’s Fences, which features the veteran actor both behind and in front of the camera. The film opens in 1957 following Troy Maxson (Washington) as an aging African American sanitation worker trying to make his way in Pittsburgh with his wife and teenage son. When we first meet Troy, he’s riding on the back of a garbage truck working alongside his friend Bono, and we spend the first 20 minutes or so just listening to the pair chit-chat and talk about life. You quickly come to feel like you could listen to these two longtime friends ramble on for hours. Through what honestly feels like just a snapshot of their day-to-day routine, we meet Troy’s wife, Rose, and his 34-year-old son, Lyons, who we soon realize isn’t Rose’s son. We feel the tension between Troy and Lyons and also the playful relationship between Rose and Troy. We then meet his brother Gabriel, who is mentally challenged after having been wounded in the war — as well as Cory the teenage son of Rose and Troy – and it simultaneously adds more depth and tension to the Maxson family. As the story progresses, things go from tense to downright heartbreaking as the hardness of Troy’s character leads to some unfortunate life choices and the fallout in his family that springs directly from it. As we watched Fences, I couldn’t help but feel like this cast was barely “acting;” it felt so real. 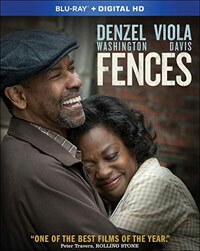 They made it seem so effortless, and you could really believe Denzel is Troy and Viola Davis is Rose. In watching the behind-the-scenes featurettes on the Blu-Ray disc, I was surprised to learn that this film was not only derived from a play written by August Wilson, but that most of the cast of this film had performed together this very play on stage in 2010. In fact, Denzel and Viola had played the role in a staggering 114 performances on stage! 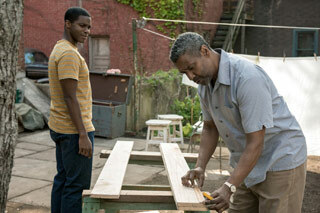 Mykelti Williamson’s performance as Gabriel was equally as convincinng and impressive, too. It just seemed like one intense and tangible performance after another. But the fact that these actors had all lived through this story over 100 times on Broadway only helped make the film that much more believable and convincing… and heartbreaking. The content is pretty heavy thematically. Troy gets a bit rough with Cory at times and they even have a serious physical fight at one point. Troy is also often talking about and TO death as if it were a person that comes and claims people, so the theme of death is a very big thing in the story, too. Troy struggles with alcohol at different points in the story, and proves to be a rather selfish man of his household. The profanity is limited to a usage or two of the “S” word and a LOT of uses of “h*ll” and the “N” word amongst the African American characters. Finally, Troy proves to be a bit of a flirt, particularly with his wife Rose, but Bono calls him out on his behavior with other women, which we do not ever see on screen. 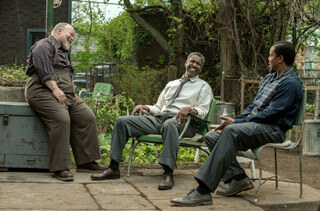 Fences is an intriguing snapshot of African American culture in the 1950s. It’s beautifully acted and proves to be a real tour de force of performances from Davis, Washington, and the rest of the team. It’s a compelling story, but also is just not for every viewer. I found the dramatic turn of events in the film to be a disappointing direction for the story to go in, which is more the “fault” of the original story and not the film adaptation or actors, but this is a film more focused on real-life scenarios than tickling the audience’s fancy. Furthermore, I found the story’s resolution a bit dissatisfying, and one could argue yet again that real life can feel the exact same way. So, much like life, Fences is a rather heartbreaking tale, albeit thought-provoking, so I’d recommend exhibiting caution when deciding if Fences is the right film for you to watch. Blu-Ray Special Features ReviewFences is available on single-disc DVD or single-disc Blu-Ray with a bonus Digital HD copy. 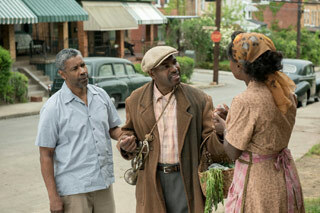 The Blu-Ray disc offers the film in crisp HD as well as with the following behind-the-scenes featurettes…Expanding the Audience: From Stage to Screen (8:53) – This featurette is about reuniting the same cast that was on the 2010 Broadway show, designing the costumes for the film, and honoring author August Wilson’s story and vision. The Company of Fences (9:17) is more on reuniting the cast from the Broadway show and adding to it the new kids for the film. Building Fences: Denzel Washington (6:56) focuses on Denzel returning to play Troy again and also taking up the role as director for the film. Denzel talks about wanting to do right by August for the film. Playing the Part: Rose Maxson (6:57) – Viola Davis reflects on her role and being able to represent faithfully the women of the 1950s, as well as the love Rose has for her family. Viola also gives more insight into her incredible Oscar-winning performance! August Wilson’s Hill District (6:25) talks about taking the production on location to Pittsburgh to film Fences in the same area where August grew up! Alcohol/Drugs: Bono and Troy share a bottle of gin between the two of them; Troy opens a bottle of gin and pours some out and shares it with Bono and Lyons; We see Troy drinking at a bar; We see Troy drunk sitting on his front porch. Violence: Troy smacks some pots and canisters off the top of the stove in the kitchen out of anger; Troy smacks Cory in the chest; Troy tells a story about messing around with a girl and getting whooped by his dad who then wanted to sleep with the girl himself. He then admits to whooping his dad in return, and later mentions killing someone and going to jail for it for 15 years; Cory angrily throws his football helmet at the front of the house; Troy roughly grabs Rose’s arm when she tries to leave and he still wants to talk to her. Cory runs out of the house and pushes Troy into the metal fence. Troy shoves Rose out of the way and confronts Cory; Troy pushes Cory twice while they argue. Cory swings at Troy and misses, so Troy shoves Cory’s head away and smacks him across the face. Cory swings his bat at Troy. Troy pushes him down with the bat and shoves him against the fence and then holds him down at the throat with the bat; Rose slaps Cory in the face and shoves him.